English financier; born in Frankfort-on-the-Main in 1815; died in London Oct. 20, 1887. 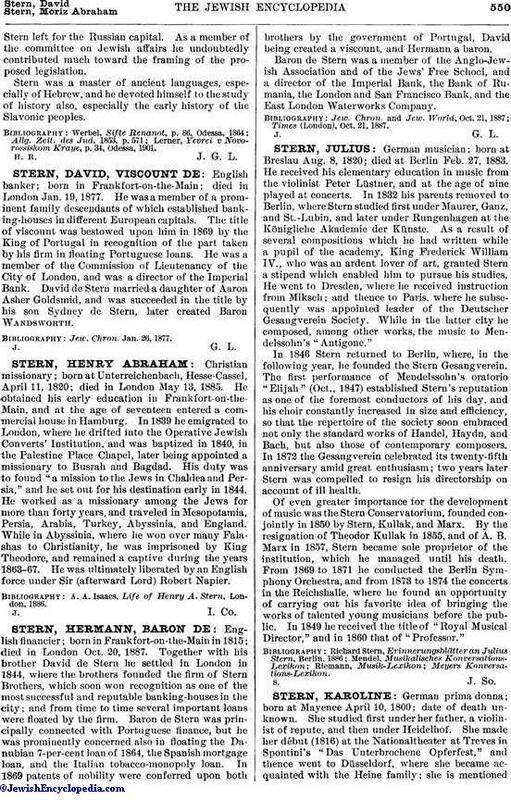 Together with his brother David de Stern he settled in London in 1844, where the brothers founded the firm of Stern Brothers, which soon won recognition as one of the most successful and reputable banking-houses in the city; and from time to time several important loans were floated by the firm. Baron de Stern was principally connected with Portuguese finance, but he was prominently concerned also in floating the Danubian 7-per-cent loan of 1864, the Spanish mortgage loan, and the Italian tobacco-monopoly loan. In 1869 patents of nobility were conferred upon both brothers by the government of Portugal, David being created a viscount, and Hermann a baron. Baron de Stern was a member of the Anglo-Jewish Association and of the Jews' Free School, and a director of the Imperial Bank, the Bank of Rumania, the London and San Francisco Bank, and the East London Waterworks Company. Times (London), Oct. 21, 1887.